It began two days after Thanksgiving, 1972. If not for Agnes, it might have started a few years before that. 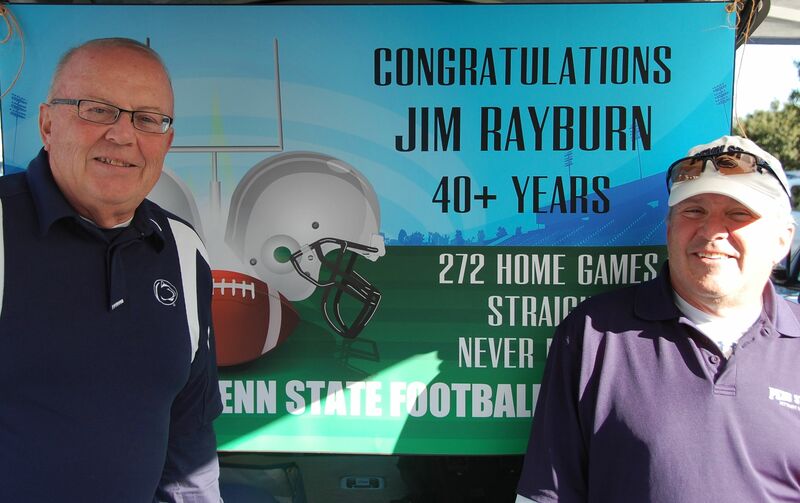 Jim Rayburn ’62 had seen plenty of Penn State games before that cold November afternoon, when he drove down from his home in Corning, N.Y., to catch the Nittany Lions’ regular-season finale against Pitt. His family had owned season tickets since the late ’60s, and he tried to make it down for every game, but the disruptive legacy of Hurricane Agnes interrupted his plans. The floods she brought in June had inundated the Southern Tier, and it wasn’t until late October—”when the house was all put back together,” Jim says—that he could start thinking about making the two-and-a-half-hour drive down to State College. When he finally did, it was the final home game of the season. “It started with Pitt,” he says. The Lions won it in a rout, 49-27, the highlight of a 10-2 season. Rayburn was back the next fall, and each fall after that — every home game, in fact, even after that two-and-a-half-hour drive became a 16-hour round trip from his new home in North Carolina and back. He’s been back this season, for the home opener against Eastern Michigan, and again for Saturday’s game against UCF. Saturday started gray and chilly and turned early-autumn perfect a little after noon, and Rayburn was enjoying it in his familiar tailgating spot just south of Beaver Stadium. He was there with his brother, Dave ’70, who joins him for most games from Florida, and the “neighbors” they’ve parked next to for years. They had good food and cold beer and a small Tupperware container of Jim’s wife’s homemade chocolate-chip cookies. Like a lot of us, Jim knows there is no better way, and no better place, to spend a Saturday in the fall. Saturday felt a little different. Celebratory, but bittersweet. Mostly, it was necessary. Jim won’t be up for Kent State next week. His wife has been growing insistent about that drive, eight hours each way, sometimes by himself, and, in a September like this one, doing it three weeks in a row. It might well be liberating, this ending. His brother Dave says that Jim was increasingly mindful of the streak, that maintaining it risked becoming more about the streak itself than the experience of making the trip. With that out of the way, Jim says he plans to make the rest of this season’s home games. “Whether the wife knows about it or not,” he says with a grin. Saturday was one of those: a tough game, a disappointing finish, a challenge for a young team whose players, most of them, have already been through a lot. You get up off the ground, brush yourself off, come right back at it. Jim is confident that, even as he roots from afar, the Lions will turn things around this week. And before long, they’ll have Jim Rayburn back in the building. Homecoming, fittingly, is just four weeks away. For more on The Football Letter, including online archives (requires Alumni Association member log-in), click here. 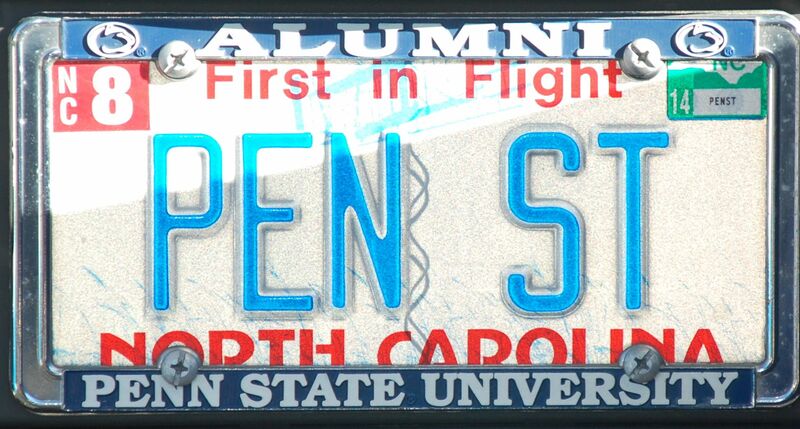 This entry was posted in Penn State Alumni and tagged Dave Rayburn, Jim Rayburn, Michigan, Notre Dame, Pitt, Tailgating, UCF. Bookmark the permalink. I’m one of Jim’s neighbors in the parking lot and my entire tailgate crew has become friends with Jim & Candy & Dave. My wife & I have visited them in NC, played with their pooch Cody, and shared the highs and lows of the past (and present) seasons in almost weekly telephone calls. We’ll miss him Saturday, maybe we’ll have a drink (or four) for him. 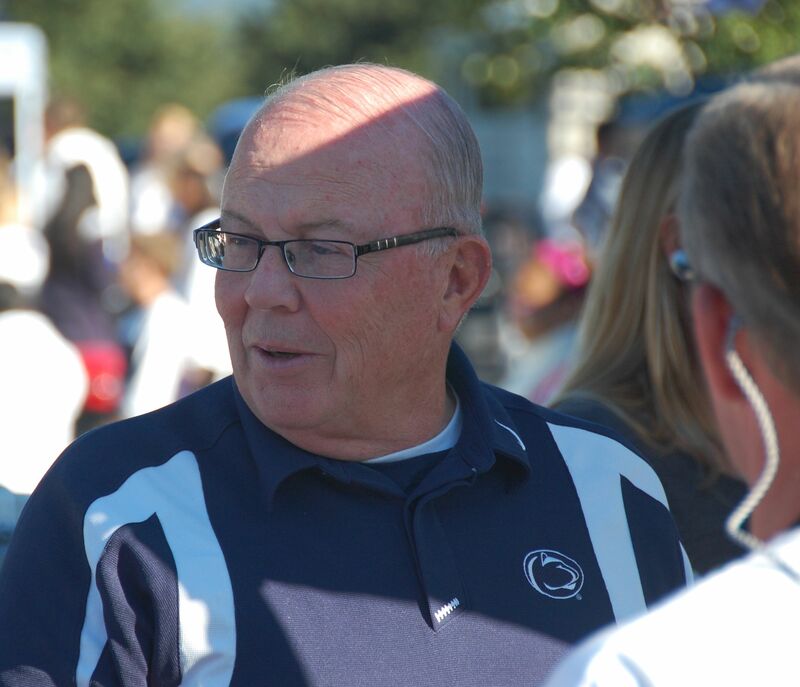 Jim is the true embodiment of Penn State, a gentleman regardless of the outcome of the event. His loyalty to the university is always unwavering. He truly is Penn State! Awesome guy! Great couple and true Penn State fans. So glad to know them!! Thanks for all the comments. And Glenn, I didn’t see the photo, but I did check out the photos on the Facebook page. Looks like you guys had a great time — and didn’t have to get soaking wet like we did up here. Jim is a great guy, super neighbor, as well as a great musician. He played drums with the Three Rivers Dixie Jazz Band in Corning for many years and we miss him here. He may have had an itch to play in the drum line in the Blue Band. It is nice to read this story about his loyalty to Penn State. Jim and I used to hang together when we were single. We became neighbors when my wife and I moved a block away on the same street. We couldn’t have better neighbors or friends than Jim & Candy. This is a great story. Jim is not only loyal to his school but to his friends and neighbors as well. Jim, we’ll be looking for you when come to Corning.